This patch fixes most issues related to engine branch incompatibility and is designed to run using the latest "Beta" of Half-Life Steam version. Instructions on how to install and use it are within the archive. is designed to run using the latest "Beta" of Half-Life Steam version. Instructions on how to install and use it are within the archive. 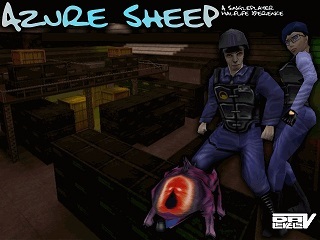 Link to Azure Sheep mod. Source code for the patch. - "Could not load library client." when launching the mod. - liblist.gam now has correct parameters. - .357 Python reload sound not playing. - Fixed Kate not being able to activate retinal scanners. apache crash, on map asmap00b. - Musics not playing in intro and outro levels. - Added "Custom Game" option to menu. - Added mod icon to Steam game list. If you have any questions related to this patch, please let me know. Criticism & suggestions are greatly appreciated. Do I need to also download the original Steam patch, or does this new one replace the old one? every elements of the previous one, if necessary. If you have other questions, please let me know. First: MP5's dropped by Human Grunts cannot be picked up, it happened after i picked up the first MP5. Second: The Grunt with balaclava doesn't appear when using a shotgun, in place is shown the Gas Mask Grunt. About the fist bug: After i got the HEV the bug stopped. Probably only happens with the MP5 with Barney hands. Another bug: Scientists don't heal the player, they just walk in the same place. More bugs: The grunt with cigar also not shown, appers the Gas Mask one, and the Gus (those guys with orange cloths) show wrong death poses. issues once I will find sufficient spare time. unable to look into these issues for now. One more note, could you please provide the name of each level on which these bugs occur (if those occur only on a specific map). These bugs happen in all maps, should be something in the dlls. No need to hurry, despite these bugs, the mod is still playable. Got the same bugs above, and for some reason the HUD doesn't appear at all, is that normal or what? the bugs you are encountering? be able to look into these issues. I was born and currently live in Canada. not forgotten about these issues. able to look into the issues in the past 2 weeks. I wish to thank people for their patience. to the issues mentioned above. is in about 2 days.